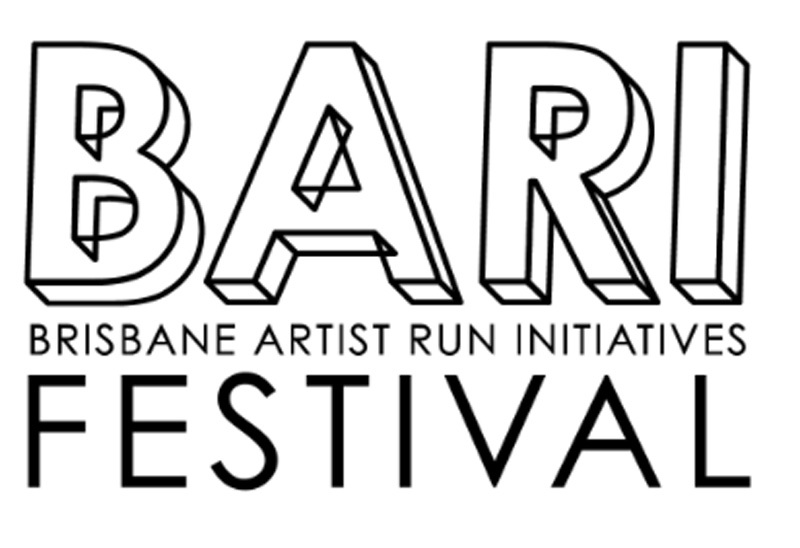 The BARI (Brisbane Artist Run Initiatives) Festival is a must-see biennial event aimed at providing a fresh creative platform and promoting audience development for Brisbane based ARIs. BARI has been running in Brisbane since 2008. 2016 BARI co-directors/artists Jaclyn Bates and David Don chat to artist Paul Andrew about this years festival opening on October 6, 2016 and their views on the artist-run impulse, past, present and future. Paul Andrew – Q. Hi Jaclyn, Hi David, tell me a wee bit about your own backgrounds as artists, how, where, when and why did your professional artist journeys begin, education etc? JB: I graduated a with a BFA (hons) at QUT in 2013. During my undergrad course, I rented a studio at Jugglers Art Space, an artist-run located in the Valley, because I had nowhere to work at home. Peter Breen and the crew there were incredibly supportive, and offered me the opportunity to work on a wide range of projects that Jugglers were involved with. I’d been involved in BARI curating shows for Jugglers, and in 2013, I was offered the chance to step in as creative director. I also am half of One place after another, an online ARI with a focus on site specific, experimental works. DD: Well first up, I am very close to graduating BFA (hons) at QUT, two months! I guess I decided to seriously pursue arts not to long before embarking on formal education at university. My foray in arts begun with graffiti many years ago which eventually pushed me to further my interests into the creative industry as a professional artist, curator and director. Similar to Jac, I have been lucky enough to have the support of Jugglers Arts Space and the champion of all things art in Brisbane, Peter Breen. Over the past six years I have been involved in a number of events that heavily focused on emerging creatives practices and youth engagement. Through these experiences I have been able to meet some amazingly passionate and generous people in Brisbane I’ve collaborated with to create larger events. I currently co-direct the Brisbane Street Art Festival, Australian Virtual Reality Film Festival and now am lucky enough to be a part of the Bari Festival. I am also one the co-directors for Corflute ARI which offers a platform to deliver an alternate space for critical discussion and creative output. Q. Tell me in some detail about the hows, whys, wheres, and whens of the BARI Festival and something of the who’s too, the motivations behind the festival? JB: BARI has been running biennially since 2008. The project was initiated by Randall and Peter Breen, from Jugglers Art Space, with the aim to engage the wider public with what and who ARIs are, and to show what they do. The aim of the festival was to offer a chance to experience different artist run spaces and practices, working beyond just a single showcase or exhibition. So many people have no idea that there is this vibrant ARI scene in Brisbane that exists away from the well known institutions. BARI was started to offer an entry point, or even just a window into that scene, as well as to foster a sense of community among the ARIs themselves. Q. Tell me a bit about this year’s festival, the aims, the motivations, the programs? A. This year finds us at a time of really great energy in the Brisbane ARI scene and that’s something we want to support. We’ve been looking at ways that BARI can grow to offer new opportunities for collaboration between Brisbane and regional ARIs, and have invited ARIs from Toowoomba and the Gold Coast to be involved for the first time, which we’re really excited about. We are also including an ARI led public forum in the program. The forum will take place over two weeks at The Powerhouse, and will be run by Inresidence and Corflute ARIs. This forum will be a chance to continue the really strong conversations that have begun through the ephemeral traces exhibition, and Boxcopy’s Homeground series. This year we hope to create more opportunities for events/ collaborations and dialogues to continue after the festival itself. To start things that don’t finish when BARI is over. Q. Tell me in some detail about one or two of your own most memorable BARI artist-run events/experiences so far guys, what you truly loved about it, and what was challenging about it perhaps? A. In 2014,we were offered the most amazing space to use for BARI, an entire vacant level of an beautiful heritage office building in the CBD. The space came through very last minute, and Jenna and Meagan from Inhouse ARI pulled off an incredible show there, CTRL+SHIFT+SPACE. That came together in a matter of weeks. To see something so polished happen in such a short time was amazing, and perhaps something that could only have been pulled off by an ARI. By which I mean Inhouse could call on this really tight network that they had available as an ARI and didn’t have to worry about jumping through hoops/ taking formal pathways. They got good people together for a series of conversations, and the result was amazing. Q. There seems to be an abundance of artist-runs unfolding/generating in Brisbane this year after the emergence of new arts graduates, what is happening, why and how and where? Tell me about one or two artist-run examples you like heaps and why so? JB: I think the closing down of a few big opportunities for arts graduates had a lot to do with the initial push, and then ARIs like The Laundry, Cut Thumb and Fake Estate really led the way for a new wave of ARIS to follow. There does seem to be a lot of support from the Brisbane arts community for new ARIs right now, so perhaps it’s a less intimidating time to try something new. DD: It definitely feels like we are seeing work from a larger and more diverse group of artists than we were a few years ago, and that’s a great thing. ARIs I like right now? Such a tough call, I’m right now seeing all of these really incredible proposals come through for BARI, and they’re blowing me away. The Laundry, Cut Thumb and Kunstbunker are tapping into the under the house/ in the back shed locality, and doing it really well. InResidence are curating group exhibitions to set themes from locations that are undisclosed until just prior to the show, Fake Estate are operating out of a garage and also a gallery space at Metro Arts, and enabling a critical dialogue between their audience and artists at their critical brunches. Clutch collective are doing something completely unique in the current scene, exhibiting out of the back of a hired truck. There’s too much to like right now. Q. And so many different models and methods being used today all around the world for artist-runs, tell me about your thoughts on this cultural biodiversity, and something about artist-runs in Queensland regional areas like the Gold Coast, Toowoomba and so on? JB: I think this biodiversity is an example of what a fluid thing an ARI can be, completely adaptable to the needs of the local artists and wider community. I haven’t spent time in regional QLD ARIs, but I’ve heard so much good about Toowoomba and the Gold Coast. In regional situations, there often seems to be the common theme of artists creating their own opportunities in a region, and changing/ adding to the cultural landscape of their area as a result. Q. Did you manage to visit the Ephemeral Traces exhibition about 1980s Brisbane artist-runs at the University of Qld Art Museum April- July this year, and if so, what did you love or indeed not love about this exhibition? What was astonishing about the exhibition, what did you learn, did it inspire you in some measure perhaps, what got you thinking differently perhaps? JB: Yes, I did go, and what I liked most about the exhibition was the sense of continuum. ARIs are always going to be addressing different things in different times, but I think the evidence of a tangible history and evolution of Artist-Run Initiatives, specifically in Brisbane, gives a context to what we are doing now, reaffirming a sense of identity as an arts worker, and as an artist, which are sometimes tricky things to define, and be. Q. Brisbane has such a wellspring of artist-run heritage since the late 1970s, in fact the 1940s with Barjai and Miya Studios no less, and in a similar way, what are your enjoying about the related research unfolding now at remix.org.au ARI Remix Project, artist-run archives 1980-1990, or indeed not enjoying about the archive as it develops now, and do you feel it is useful today in some way(s), how so, why so, what do you feel it brings to the knowledge base? DD: I enjoy the sheer number of projects and ARIs that have been documented, looking through them, and finding the ones that really resonate with me now. The sense of building a history, bringing together all of these events/ people/ places that may have otherwise been completely lost. It’s useful today because it creates a strong ground to move forward from. So many ARIs only stick around for a few months or years, and to have a living archives document like Remix of what has happened gives a proper idea of the size and journey of the ARI culture over the decades. A. Hopeful for the future of a sustainable community of artist-runs, yes. I think it’s ok that some ARIs have a short or ephemeral presence, they might serve a purpose and then collapse/ evolve, and that flexibility is a big part of what ARIs are. I also think the ARIs that stick around do so by choice, not accident, and they are very professional in the way they develop. What ARIs bring to arts and culture heritage I don’t think it is possible for IMA or GOMA to provide, full stop. Larger institutions simply don’t have the freedom to show large amounts of work that is experimental, or still in flux. ARIs provide a space for these works to exist and develop. Institutional spaces perhaps don’t have the intrinsic understanding of the value of process in practice that most ARIs do. ARIs are more concerned with the process than a user friendly end result, so many works you see, are first attempts, experiments. They act as a platform; they provide critical engagement. That’s what makes the position of ARIs so important and unique. Q. Advocacy for and on behalf of artist-runs is an important issue, can you tell me something about how you advocate on behalf of artist-runs? A. We recognise how important artist runs are in shaping the artistic culture of our city. I guess we believe that the more opportunities there are for emerging and experimental artists there are locally, the less creatives we’ll lose to other locations, and Brisbane will become more attractive to emerging artists from further afield. We’re doing our best to make the work done by local ARIs accessible to a broader public, and have their role in the larger environment of contemporary art understood. It’s not really a new conversation is it? But it’s one that needs to keep happening. We want it to be understood that ARIs have an equal, parallel value in our cultural landscape to the institutions we’ve been talking about. JB: I think a dedicated artist led alliance, that helped ARIs with various spaces, alternative funding models and collaborative opportunities would be incredibly useful. Flying Arts, NAVA and BNE ART among other organisations, already do provide some really great professional development opportunities and information for artists, but something purely for artist runs could be great. I think that ARIs could do with more support in seeking the funds to invest in their staff, just about everyone is working for free, which just doesn’t work long term. Q. Perhaps there also needs to be a regular annual artist-run expo or artist-run fair in Brisbane too, much like the vibrant culture of artist book fairs around the world that are so popular today, and perhaps GOMA would be interested in collaborating on something like this? JB: I think this is something we try to emulate on a small scale with BARI. If it gives emerging and experimental artists the chance to develop their works, engage with a new or wider audience, and leads to opportunities to develop their practice, and forge new collaborations, we’re all for it. For GOMA to collaborate on something like this would be excellent. Q. And what does the future of this year’s BARI Festival events look like from where you are standing now? A. Great! We hope for BARI to becoming real platform for opportunity for ARIs. To create links with different regions and countries, so more emerging and experimental work gets made, seen and heard. We’re seeing a really great program emerge, and even some works and collaborations that are going to continue to build past the end of the festival itself. BARI grows and evolves in a pretty organic way, so we’ll keep conversations going the best that we can, and build on the strong points from this years program. We want to keep reaching out geographically to ARIs further afield, so ideally in future years we’ll see satellite events and collaborations from around the country and overseas. Q. Anything else you guys would like to add perhaps? Yes! Obviously, if you’re in Brisbane, get along to BARI, we’d love to see you. The forums will be happening at the Powerhouse on the 13th and 20th of October, and the rest of the program will be available soon on the BARI site.